Note from racketboy: Special thanks goes to Scooter for putting this guide together! 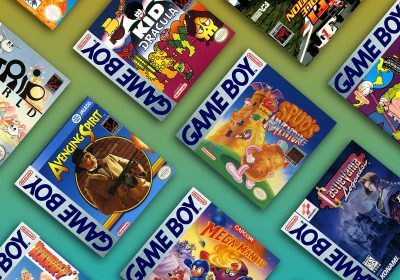 The RetroGaming 101 series is aimed at gamers who are just starting out in the classic gaming scene or are curious about an older console that they don’t know much about yet. Those of you that are especially knowledgeable about the featured machine, I encourage you to add any information that you think would be beneficial into the comments section. If you are new to the featured console, and still have questions, you can also use the comments section and I will do my best to help you out. In the early 1990’s Sega did the impossible by breaking free of Nintendo’s early power grip on the console game industry. 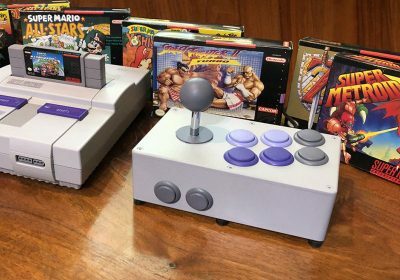 Not only did it lure away many gamers from the dominant NES, but Sega started a cult following of its own and continued to carry on the battle against Nintendo’s 16-bit SNES. Even though Sega had some great games and consoles that followed the Genesis, the 16-bit era was still its peak of stardom. In this guide, we’ll take a look at what made the Genesis great and how you can get the most of the machine more than a decade later. Another note: Sega’s 16-bit wonder was titled the Mega Drive in all markets except North America where the name had previously been copyrighted and was thus named the Genesis in that market. For purposes of this article, the term Genesis will be used but should be noted that it is interchangeable with the name Mega Drive. Additionally, the Sega CD was named the Mega CD outside North America. The Sega Genesis was the first console to give meaningful worldwide competition to Nintendo’s firm grasp on the home console market. 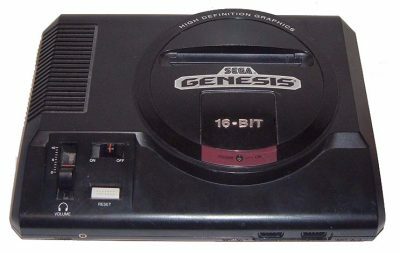 The marketing of the Sega Genesis produced the first worldwide “console war” (Atari and Mattel had gone head to head years before but almost solely in the US market alone). The Genesis was produced over an impressive 14 year retail life span. The Genesis was usually marketed to a more mature audience by offering more games with mature content thus paving the road for video games to become more than a toy or entertainment for children alone. The Genesis, along with it’s contemporary competitors, helped bring home console gaming more significantly into the mainstream of home entertainment choices. The inclusion of more mature content in games, predominantly pioneered by Sega for games available on the Genesis, led to video game rating systems. The Sega CD, 32X and Power Base Converter peripherals expanded the software capabilities of the base system and extended the life of the hardware. The Genesis platform saw the introduction of one of the most recognizable, prolific and enduring video game characters of all time, Sonic the Hedgehog. The Genesis platform provided powerful graphics processing, multi-layered backgrounds and stereo sound capabilities which were impressive in it’s time. The system was first released in Japan in 1988, North America in 1989 and in Europe in 1990. The Genesis remains as Sega’s most successful console selling roughly 29 million units worldwide. 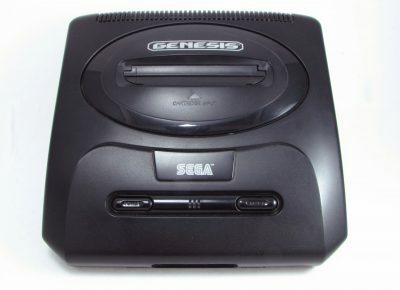 More information on the Sega Genesis on Wikipedia.org. Games produced and published by Sega itself were always the Genesis’ platform’s strongest selling point. Coupled with liberal licensing which brought in numerous large and small third party developers, the console always enjoyed a wide variety of games which appeal to a broad array of gamers. A very large game library (Over 500 Titles). Given the longevity and mass appeal and sales success of the hardware, most major and minor game developers of the era brought game after game to the platform, most of which are still available in readily available quantities and most at reasonable prices. The console’s game library contains an impressively strong array of games in almost every game genre. 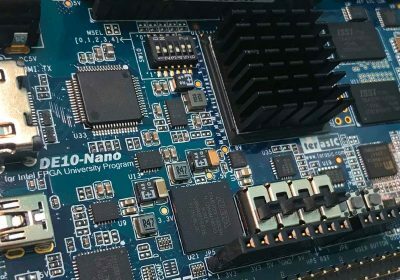 Simple straightforward yet powerful hardware architecture (base unit Genesis at least) provided the opportunity for first and third party developers to more fully exploit the capabilities present in the hardware. This translates into more impressive graphics, abilities, sound and overall game presentation. The first major console to have games that were sold in durable, consistently sized packaging. This a boon to gamers who are also collectors. Many innovative games and some innovative peripherals. Backwards compatibility with Sega Master Systems games via the Power Base Converter which significantly expands the overall game library without needing to add a complete additional console. 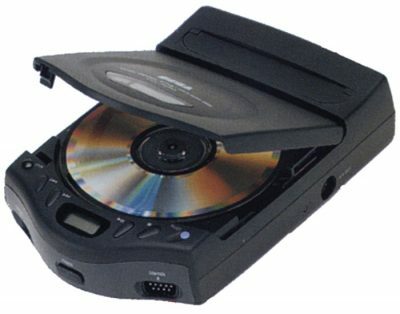 Expandability with the addition of the Sega CD and/or 32X units which provides access to additional game libraries, some of which are entirely exclusive to those attachments. A substantial and strong fan base which allows for a large and active community within which to investigate reviews and impressions of games and hardware and within which to locate harder to find items and to provide technical support. A great number of licence-based games are available (games based on movies such as Jurassic Park, Disney properties, or pop culture icons such as the Simpsons) so retro gaming enjoyment can be tied to favorite movies, cartoon/comic characters and television programs. This is also great for younger children starting out with games. The color palette is relatively small with 512 colors possible yet with only 64 on-screen colors possible at any one time. Aside from the very early Genesis units, most base units and software contain regional lockouts providing a great deal of incompatibility between products made for the North American, Japanese and European/Australian markets. 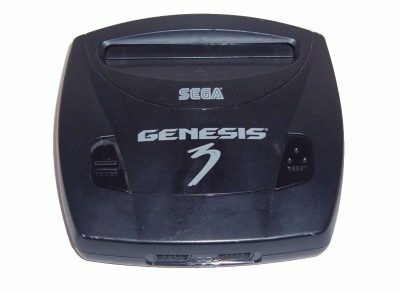 The model 3 Genesis marketed by Majesco late in the Genesis lifespan are incompatible with the Sega CD, 32X and Power Base Converter hardware add-ons. Model 1 base units cannot provide stereo output directly to a stereo amplifier or television without the use of a secondary cable. When properly coupled with a Sega CD unit, even the Model 1 unit can provide stereo output via a typical A/V cable connection. Game cartridges with a battery powered game save memory may require the replacement of the battery to allow game saves to be maintained. Typically, the replacement of the battery will erase previous saves if they are even still retained. Games with mature content are perhaps not suitable for young children. Games published prior to the creation of video game rating systems may not provide alerts to the fact that the game may contain content inappropriate for younger gamers. This is the original Genesis unit, it is wide and flat molded in black plastic in a roughly rectangular shape. The unit has two control pad connections on the front as well as a stereo sound mini-pin output receptacle and includes a volume control slide switch for the stereo sound output. Suposedly, the Model 1 is the easiest to perform modifications on it for regional bypasses, overclocking, LED change and S-Video output. It is also said to have the best audio output. This is a simplified Genesis unit. This noticeably smaller unit is roughly squarely shaped. The stereo output is now included in the A/V outputs at the back and no volume control for the sound is provided. Again, two control pad connections are provided. The unit is molded in black plastic. This is a further simplified and even smaller unit yet roughly squarely shaped. The basic controls and outputs mirror the Model 2. This unit is molded in black plastic. These units are not compatible with Sega CD nor the 32X. This is a relatively compact unit that combines the hardware of both the Genesis and Sega CD into one relatively small unit. The unit provides two control pad outputs at the front, a small array of CD system control buttons at the front top edge, a CD system door in the middle top and a cartridge slot at the top rear. AV outputs and AC inputs are found on the sides of the unit. This portable handheld unit contains an entire Genesis hardware system and a backlit full-color screen in a handheld design. The front of the unit contains the typical control pad buttons and the screen. The top contains the cartridge slot, on/off switch, player 2 control pad and AV outputs. The Nomad is not compatible with Sega CD, 32X or Power Base Converter. 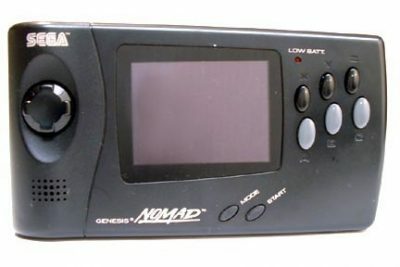 The Nomad is incompatible with a very small, perhaps 2-4, number of Genesis games. This unit is similar to and the precursor of the Nomad and was only available in Japan. 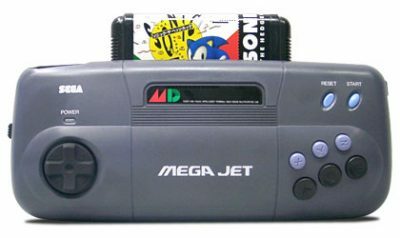 The MegaJet contains the control pad and game cartridge features of the Nomad, but does not contain a viewing screen and as such must be connected to a television screen for game play. As with the Nomad, the MegaJet is not compatible with Sega CD, 32X or Power Base Converter. These units combine the Genesis and Sega CD hardware into one complete package. The Pioneer LaserActive was a stand-alone laser disc based game system. Additional modules could be purchased which would allow, among other things, Sega Genesis or PC Engine/Turbo-Grafx 16 games to be played. Essentially, it was the cutting-edge hub for electronic home entertainment in its day. Power Base Convertor – This add-on was available around the launch of the Genesis and allowed loyal Sega Master System owners to be able to play their existing library of games on the Genesis. A few games were incompatible with the PBC. The first and much more prevalent PBC was designed to fit into the Model 1 Genesis and will not fit onto a Model 2 Genesis. 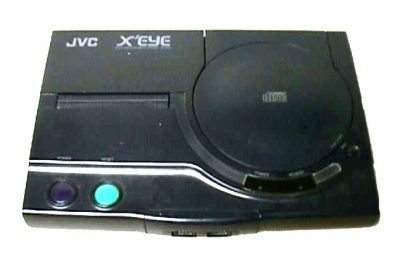 This earlier PBC included a card slot at the front to allow the adapter and the Genesis to also play game card-based SMS games, not just the cartridge based games. This card slot also allowed for the use of the 3D glasses adapter for 3D enhanced SMS games. A later Master System Converter II was offered in much smaller quantities which acted as a SMS game adapter for the Model 2 Genesis console, however this unit does not provide a slot for card based games and as such also does not allow input for the 3D glasses peripheral. More Info: We will have both a Sega CD 101 and Sega 32X 101 in the coming months. The list of peripherals for a popular system which enjoyed a long production life such as the Genesis is exceptionally long and we could not hope to list them all, however we are providing a list of the more popular or innovative items made for the Genesis. The Game Genie – This is a “cheat” device that allows the player to alter the parameters of many game such as providing infinite lives or extra ammo. The Game Genie is only one of many such devices, though the Genie is the most common. Many books were published containing the codes required to make use of the enhanced game play features and most of the codes are still available today via the internet. These devices also allow some import games to be played by fooling the machine into believing the region setting on the game is the region setting expected by the machine being used. The device plugs into the cartridge slot and then the game cartridge is plugged into the top of the device itself. The Activator – This device replaces the control pad and is predominantly intended for use in fighting games which became a popular genre during the Genesis’ lifespan. An octagonal shaped hoop containing sensors is laid on the floor and the player stands in the center of the hoop. By punching or waving their arms and kicking their legs at various points above sections of the hoops, various control pad controls are sent to the base unit. They idea was to attempt to act out the actions required in the game that the game character needed to perform and thus the player is more interactive with the action. The units’ sensors were not entirely effective and accurate and this item should be considered an interesting gimmick worth collecting for the interest factor than for an actual expectation of Wii-like peformance or game interaction. Similar and even more unsuccessful baseball bat and golf club peripheral systems were also available and as such were limited use with the specific games for which they were designed. The Menacer – This is Sega’s own light gun peripheral, however it is only compatible with a few specific games designed for its use. The gun requires batteries unlike other light guns which draw power from the control pad connection. The gun has rifle stock and gun sights attachments that can be attached or removed as desired providing configurations anywhere from a handgun to a rifle with a scope. This particular gun uses a separate communications sensor which must be positioned on top of the television and as such the unit is more difficult to configure and it is not horribly accurate. This peripheral too should only be considered for its collectible interest and not as a useful light gun. The Enforcer – This is a light gun made by Konami and as such is compatible only with Konami light gun games and a few other games by other publishers. This gun can be coupled with a unique second player gun for two player action. The second player gun can ONLY be used in conjunction with the one player gun. Since the gun uses typical light gun technology, it will only function properly with a picture tube (CRT) type television, LCD, plasma and projection screen TV users are out of luck here. Arcade control stick, enhanced feature and 6-button controllers – Sega certainly had their own brand name items in these categories but many more were offered from any number of third parties and provide varying arrays of features. Arcade sticks typically are larger laptop or table top control pads in which the typical d-pad is replaced with a control stick similar to those found on arcade game consoles. Most of these pads have large buttons often with slow motion and turbo fire settings available individually for each button. Enhanced feature control pads are available in the standard 3-button configuration and the later 6-button configuration. Many offer turbo-fire (rapid fire provided by simply holding down the button) and slow motion (the game play is repeated paused and started while the button is held down so fast action sections can be reacted to more easily). Some of the more advanced pads include additional buttons which can be programmed to deliver the equivalent of a series of button combinations and can be quite useful in fighting games where often complex series of button combinations are required to make strong moves in the game. Many other pads simply provide a different ergonomic design. Six-Button pads arrived toward the later segment of the Genesis lifespan. The pad provided 6 action buttons as opposed to the previous three. The 6-button pads can be used with all but a handful of earlier games. When used with games not designed to make use of the extra buttons, the pad simply functions the same with the extra buttons simply not being employed. Games specifically designed to make use of the extra buttons are typically clearly marked on the back of the packaging as having the 6-button pad capability. Most games designed to use the 6-button pads also will function just fine with 3-button control pads. Multiplayer adaptors – There are a number of multiplayer adapters which allow for up to four players to participate in games designed for multiplayer action. Since the Genesis is designed with only two control pad input sockets, such an adaptor is required to attach 3 or 4 control pads. The most common versions of these adaptors are the Sega version and the Electronic Arts 4-Way-Play. The EA 4-Way-Play was only compatible with EA games and of course only on games designed to allow for up to 4 players. The original Sega multitap only worked with Sega games, later versions worked with Sega and EA games. CodeMasters sold some games in the European market in what they called J-Carts which also allowed for up to 4-players. The J-Carts included two additional control pad input sockets on the top of the game cartridge itself so no additional adaptor was required. Sega Mouse/Mega Mouse – A few games were designed which allowed the player to replace the typical control pad with a mouse peripheral much like a typical mouse used with a desktop computer. The games which support this peripheral are few in number and are typically point and click adventure games. Wireless controllers – Since they are infared-based, these official wireless Genesis controllers need direct line of sight and aren’t quite as dependable as the RF-based wireless controllers we are used to on newer consoles. For more information and pictures, check out this thread in the forum. Games That Defined The Sega Genesis – There were many games that defined Sega’s personality in the early 1990s. The earlier titles may not be very exciting by today’s standards, but the Genesis library was gradually strengthened by a number of unique and exciting games. The Best Undiscovered Sega Genesis Games – If you have already filled your collection with all of the most popular titles, take a look at this extensive list of excellent games that did not get the attention they deserved. 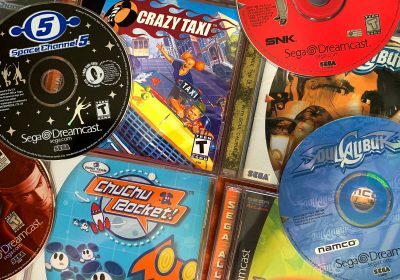 The Cheapest Sega Genesis Games Worth Your Time – If you want to build your Genesis cart collection quickly on a budget, take a look at this guide to get your the values. A good number of region-specific games can provide an expanded library of games to those willing to address the technical requirements to make access to such games possible given their home television environment. North American based units can have easy access to Japanese games with the use of a cartridge slot based unit such as the Game Genie, yet access to European based games can potentially require much more involved technical accommodations. System modifications such as adding region switches and SCART outputs can be readily accomplished on most model 1 and model 2 hardware. Emulators are available from a variety of sources such as Windows Mobile, iPod, PC, Playstation Portable, Game Boy Advance, Nintendo DS and Palm OS. If you would like to learn more about emulating the Sega Genesis, check out this guide for setting up Kega Fusion on a Windows PC. You also have commercial emulation options like the Wii Virtual Console or the Sega Genesis Collection on the PS2 and PSP. Due to the fact that a large number of hardware units were manufactured and sold and that software was also sold in large numbers, most of the basic hardware and software are readily available at reasonable prices. Solid base hardware units can be obtained for $50 or less. 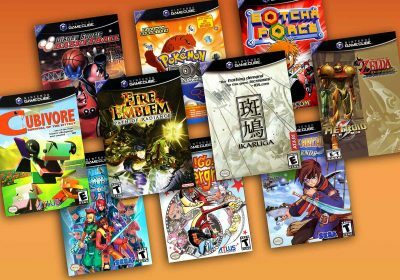 Many cheap games availible – Many of the more popular games can be obtained locally in larger cities with stores which cater to older games for $10 or less. Loose games without packaging can often be obtained for just a few dollars. 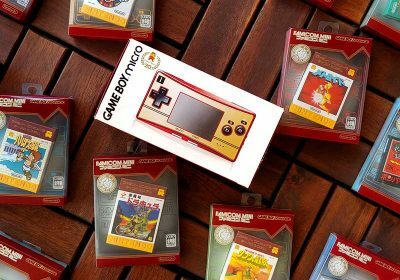 Some of the more rare hardware packages and games can be difficult to find in complete condition which includes all packaging, manuals and software and as such can command increasingly steep prices. The Sega CDX (see Hardware Variations) can often approach $200 for a complete, boxed unit in pristine and collectible condition. Hooking Up The Genesis, Sega CD, and 32X – Need some clarification on how to hook up all the cables for the many hardware combinations? Check out this forum thread. Sega Neptune Reborn – The Sega Neptune was a official Genesis + 32X hardware variation that was nearly released, but was scrapped as the Sega Saturn release drew near. This homebrew project tries to recreate the concept inside a standard Model 2 Genesis case. Mini Sega Genesis – Ever see those little “TV Games” plug in devices that have built-in games on them? You can hack them into playing actual Genesis cartridges. Portable Sega Genesis – Sure, you could go out and buy a Nomad, but you could also build one yourself like Ben Heck did. Some great miscellaneous Genesis / Megadrive hacks can be found at MMMonkey as well. Kinda funny how the games shown are the complete wrong type to use an arcade stick on. great write up! The mod link for the s-video and overclocking is great. I’m gonna do it. The mega drive was more popular over here in the UK as it was a lot cheaper than the SNES, tbh where I was everyone still had Amiga 500’s and Atari ST’s when the consoles came out. The Apprentice, are your referring to the slideshow? good article, but could use editing . No, actually I was referring to the ad that was shown with Afterburner II and Super Monaco GP, and how playing these games with an arcade stick was supposed to make it more arcade-like. Which games supported the mouse? opticledilusi0n, thanks for spotting those mistakes — I have fixed them. I have a problem trying to find the Built in game (leaving the cartridge slot free, and starting the console would then start up the game I’m talking about) that went with a Sega I had ages ago (looked like and/or might’ve been Mega Drive/Genesis). I remember it being called “Max”, but that might just be plain wrong. You controlled a fellow around like in super mario, and I remember it being AWESOME. Anyone have any ideas? Rackeyboy, How in the world can you have a Sega Genesis article and NOT mention the GREATEST accessory EVER made? How dare you leave out the Sega Channel! It was EPIC! I’ll have to add that soon! Finally, I’ve found a website with relevant info on retro gaming. Thanx, Racketboy! 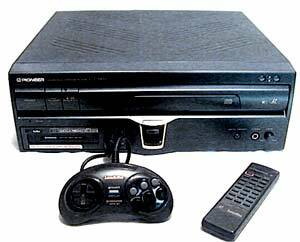 I can still remember Christmas of 1994, waking up that morning, unwrapping all of my presents, and discovering my parents got me a Genesis! I spent all day playing Sonic 2. I used to have all of the Sonic games ever made for the Genesis. Ah, those were the days…Hey, Racketboy! When are you gonna do a 101 article on the Game Boy? I’d definitely check that out, since I own one. Not sure when we will have a GB 101, but it is on my to-do list. Sega CD will probably be next. Hi, I recently bought a Sega Genesis model 1, my question is : Do I need a special AV cable or can I buy a Universal AV cable to hook it up on the TV and play. You’ll need a Model 1 Genesis AV cable — its also the same as what was used for the Master System. I have 5 sega megadrive units currently. 4 are Model 2’s, which have different model #’s. MK-1451, MK-1651, etc. (some were made in indonesia, some in japan) – my question is this – should I use a japan, european, or american genesis and how do I tell the difference in each? I grew up with a NES and later (after my brother sold mine with out my permission) I got a version 2 sega megadrive. I love this console mostly because of Sonic 2, Rocket knight advantures and mortal kombat. I think sence i dident get to appreciate my NES this became my favorite console and the very one that developed my long love for video games. I highly recomend this console for classic gamers. The color count of 64 on-screen can be a lot higher using certain tricks like the shadow/hilight mode, super fast switching of palettes, and another one which will be seen in the upcoming Pier Solar. i’ve got a model 3 genesis. Sonic the Hedgehog is the best game for the genesis. im plannin on gettin more genesis games. Is it worth mentioning that a company here in the UK called BLAZE (and elsewhere maybe?) has rereleased a portable G/MD and a mini G/MD which can be used with all the old cartridges, similar to the plug and play ones you mentioned above. you could add that to your list.